Ok, readers…get ready for a really unusual, but incredibly delicious meal. When I read the ingredient list for this recipe, I’m not gonna lie, I kind of turned my nose up. 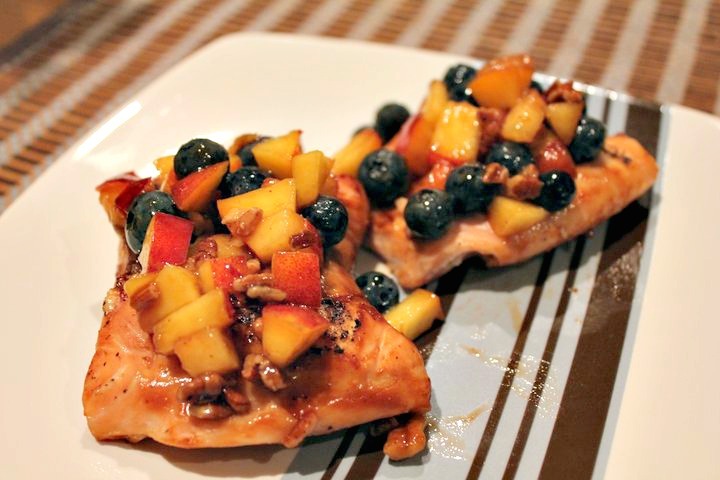 I mean, who in their right mind thought up combining salmon, BBQ sauce, nuts, and fruit? I mean it just sounded like somebody spun around in a circle in their kitchen, got dizzy, and pointed to random ingredients. And ya know what? IT WAS ONE OF THE BEST THINGS EVEERRRRRR! Seriously. It’s just an explosion of flavors and textures, and everything actually went surprisingly well together. I was shocked. I couldn’t get enough of this stuff! I’m not even kidding when I say that words cannot describe this dish. You just have to try it yourself. I told my friends about how good it was and they just said, “uhhh it doesn’t sound very good” and thought I was just pulling their leg. But I’m not, people! It really is good! So, be brave, be outside the box, and give it a try. You won’t be disappointed! Rinse fish; pat dry with paper towels. Lightly sprinkle salmon with salt and pepper. Place 2 tablespoons of the barbecue sauce in small bowl; brush sauce on both sides of the salmon. For nectarine salsa, in medium bowl combine nectarines, blueberries, pecans, and the remaining 1 tablespoon barbecue sauce. Season with salt. Serve salmon with salsa and lemon wedges.